Healthy kids + healthy fun = healthy adults. 2,400 years ago, Hippocrates said, “Walking is a man’s best medicine.” The following quote and the calorie burning information below are from Harvard Medical School’s Harvard Health Publications webpage. So enjoy your walk and your health. You’ve got a lot to appreciate! 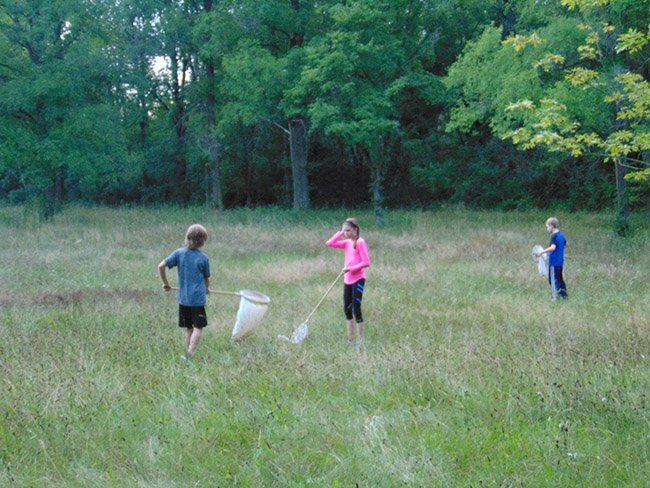 Did you know forest and wetland ecosystems make us healthy? What’s in a green space that makes us feel so good? Spring and summer rains fall from sky to ground. Percolating through the porous soil the moisture is taken up by the myriad of forest mycorrhizae. These tiny fungal “root” networks thread throughout the soil beneath our feet, and are responsible for up to 80% of a forest tree’s water uptake. The fungi absorb nutrients contained in the tree roots, forming what is known as a symbiotic relationship, meaning both parties benefit from each other. The water travels upward through the forest plant to where the leaves do their daytime magic in the form of photosynthesis – the reason we are all here breathing oxygen, the (lucky for us) byproduct of the plant’s sugar production. Photosynthesis occurs during the day when sunlight is available and produces more oxygen than is used by the plant’s nighttime respiration. During the night, while the gray treefrogs, spring peepers, and owls are calling, the trees and forest plants respire. Respiration is the process where oxygen is used to process nutrients to fuel cells and is necessary for all living organisms. Carbon dioxide or CO2 is a byproduct of respiration, but once again – lucky for us – photosynthesis uses CO2 faster than respiration produces it. Our constant burning of fossil fuels produce a huge amount of CO2 and the forest ecosystem removes much of that plus many forms of air pollutants from the atmosphere, allowing us to live healthier lives. But it’s not only Climate Change that’s affecting our environment. Other challenges include habitat depletion, loss of biodiversity, human population encroachment and corporate exploitation of wild spaces, pollution, alien invasive species and more. Let’s all keep our environment and ourselves healthy. See you on the trails! This wheelchair-friendly trail encompasses the area around the 3 cabins, and part of the forest to the west of the Resource Centre. A stairway allows access to the stream meandering along the ravine bottom. Wheelchairs must use the trestle bridge to cross over the stream ravine. The green trail marker arrows point the way for a .7 km nature and cultural education experience. Arboretum signs point out Carolinian Ecozone tree and shrub species and their uses by the indigenous peoples of the area (the Haudenosaunee or People of the Longhouse). 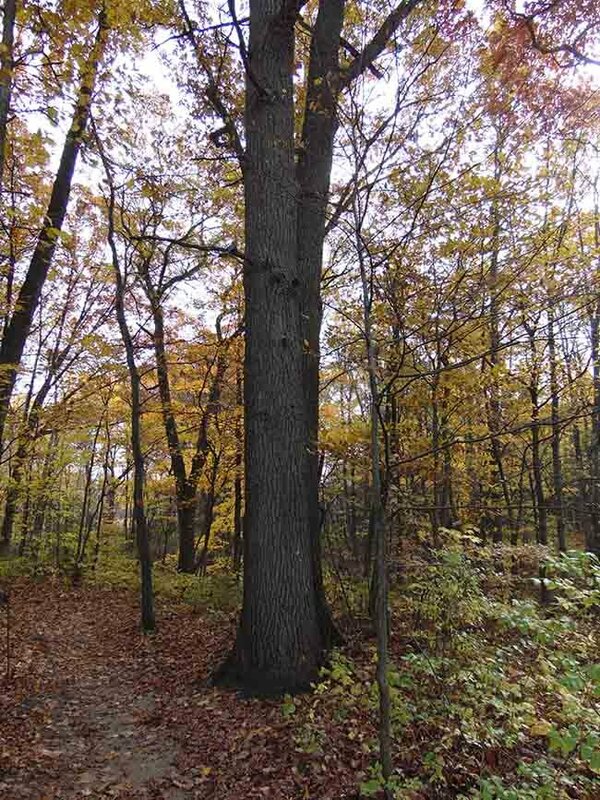 Visit our Carey Carolinian Arboretum & Trail webpage for more information. Features from the Ice Age and a Future Challenge – Much evidence from glaciation and how present geographic features formed can be observed from the trestle bridge on this trail. Fourteen thousand years ago, the last glaciers to cover Ontario started to melt and recede northward. The area around the present Great Lakes was much lower in elevation than it is now due to the weight of the ice on the land. Subsequently, the glacial meltwater pooled and formed a huge lake which covered present day Lake St. Clair, Lake Erie, and parts of Ontario, Michigan, Ohio and Pennsylvania. Much of the soil and rock particles that had been scraped by the 2 km thick ice layer from the north was brought south by glacial movement. When the glaciers melted, this sandy soil was deposited into the new lake called Lake Whittlesey. Much of this particulate matter sank to the lake bottom and formed a thick layer of sedimentation. As temperatures rose, about 12,000 ybp (years before present), the land started to rise again (post-glacial rebound) and large rivers formed which started to drain Lake Whittlesey. Some areas became river deltas where huge amounts of sandy loam soils were deposited. The area where Longwoods Road Conservation Area is situated is part of one such delta, now called the Caradoc Sand Plain. Once the temperatures increased further, the waters draining Lake Whittlesey became raging torrents, carving out large valleys which you can observe at Longwoods Road C.A.. The sandy soil was carried south and westward and helped form the lakeshore beaches we enjoy today. The warming trend did not occur quickly and took about 4,000 years to stabilize. This whole process was short in geologic terms, but to us it took a long time, lasting thousands of years. Climate change and Global Warming have occurred in less than 200 years – due to environmental damage caused by human industrialization and use of fossil fuels. The plants and animals we know in our forests and habitats throughout the world are having a hard time adjusting to the fast change. 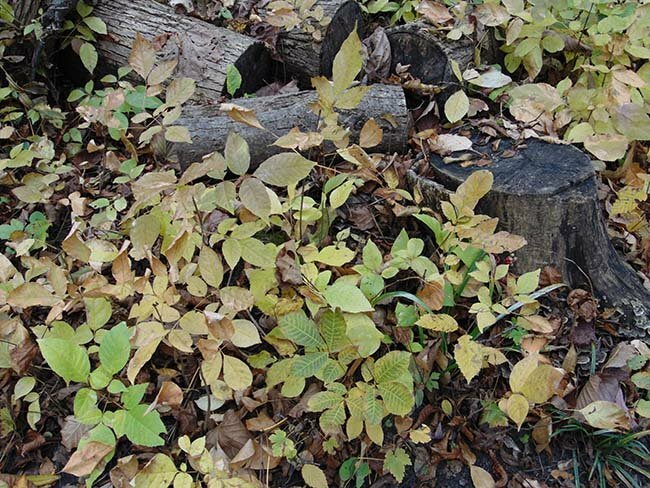 Many plants and animals that couldn’t live through the cold Ontario winters previously are now able to do so. These new occupants along with “invasive species” brought over from other countries are competing with our resident Ontario plants and animals for limited resources. We face losing many species if we can’t find and implement solutions to Global Warming. We ourselves will be increasingly affected by Lyme disease, malaria and other infections that do well in warmer climate conditions that allow their vectors to thrive. Plants: a comprehensive list of Carolinian species planted along the trail can be found here Carey Carolinian Arboretum & Trail . A list of native plants present in the Carey Carolinian Arboretum and Trail Kiosk Gardens can be found in the Planting Brochure. This .3 km winding trail takes you through a Carolinian Ecozone forest in a middle stage of forest succession. Young oak, maple, basswood and cherry trees can be observed as you walk through the forest and along the top of a stream ravine, carved out by glaciation thousands of years ago. The sand-loam soil here was deposited here 14,000 years ago when this area was part of glacial Lake Whittlesey. The trail leads to a trestle bridge where it joins the Carey Carolinian Arboretum and Trail (green trail marker arrows). Along the trail a nesting box can be observed. Southern Flying Squirrels (a Species at Risk in Ontario and Canada) can raise their young in these boxes which form “tree cavities.” This trail is not wheelchair accessible, but the neighbouring Carey Carolinian Arboretum and Trail does provide wheelchair access. 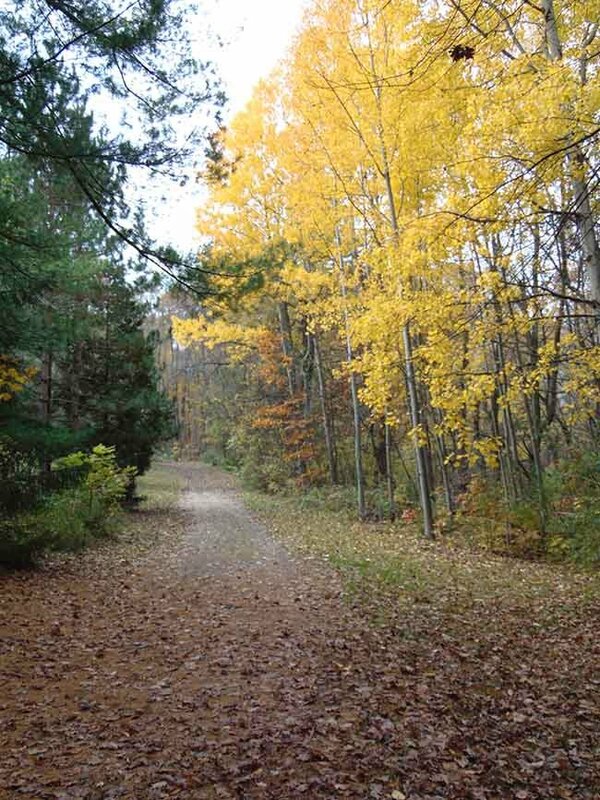 Trail Features – Provides access between roadway, trestle bridge and Carey Carolinian Arboretum and Trail. Overlooks stream ravine and provides a short hike through a deciduous forest. This .27 km trail connects the small picnic area to the Carey Carolinian Arboretum & Trail, crossing an intermittent stream that flows in the spring and dries up over summer. This trail contains some of the oldest trees at Longwoods. Large beech trees appear to form large elephant legs walking through the forest. All-terrain wheelchairs can use this trail. Trail Features – A shady stroll through a grove of larger, canopy forming trees. Spring brings a carpet of trilliums and other flowers. In spring the stream turns yellow with all of the Marsh Marigolds. This 1 km trail has the best of both worlds! The upland section meanders through Carolinian deciduous forest and includes some ups and downs in elevation. A wheelchair accessible boardwalk allows one to travel through a steep-sided gurgling stream valley down to a marsh filled with cattail and other wetland plants. A great spot to relax and take in nature on a sunny day. NOTE: as of this writing the southern portion of Millstream Trail (normally accessed via the stairway at the end of the marsh boardwalk) is closed due to maintenance issues. The marsh boardwalk remains open for use. This wheelchair friendly trail takes you past a yellow fire-access gate, through a natural alleyway of spruce, cedar and white pine opening up to a view of the Ska-Nah-Doht Village palisade wall. Find your way through the maze to enter the village, a slice of life from a thousand years ago. Once this time-travel experience is done, another awaits you. 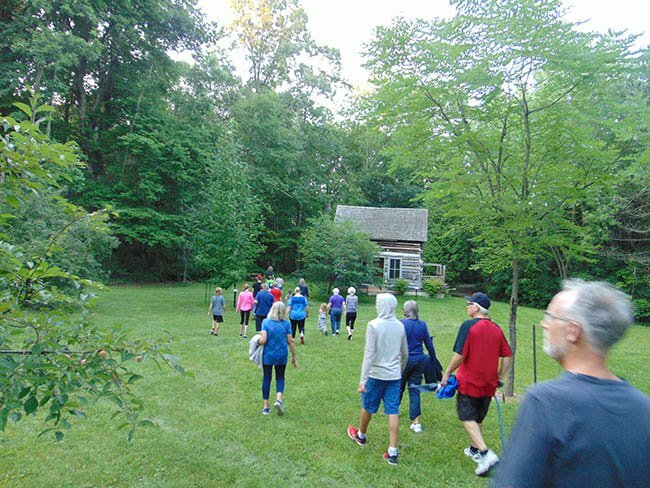 Follow the black trail arrows alongside a forested stream ravine to the heritage log cabins, donated by members of the Muncey, Chippewa and Oneida First Nations. 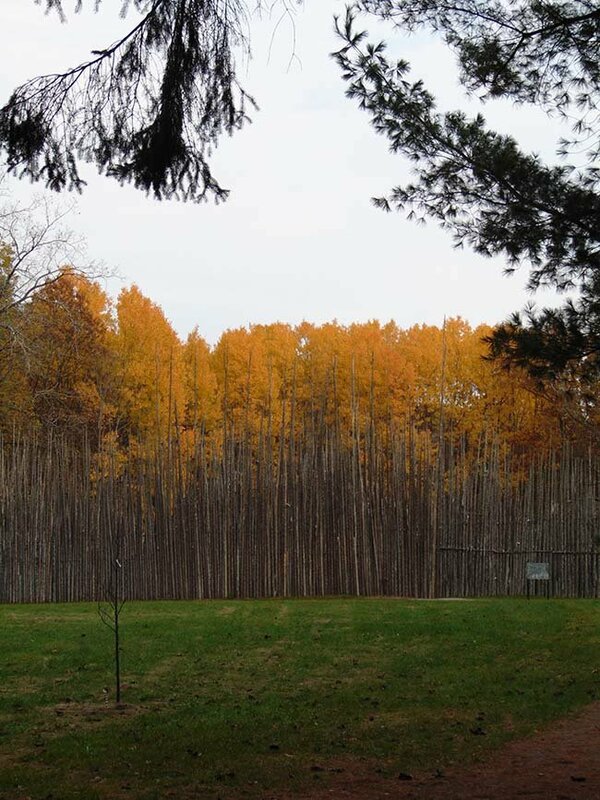 Trail Features – Easy walking along groomed pathway to Ska-Nah-Doht Village, a reconstruction of a Haudenosaunee village featuring a palisade wall/maze and three longhouses. A short distance to the forest edge access road takes you to three cabins built 200 years ago. Wildlife You May Observe: eastern chipmunks, variety of birds, lots of friendly gray squirrels and the occasional red fox! This .22 km “shortcut” enables hikers to travel from a park maintenance-vehicle access laneway to the marsh-dock viewing area. 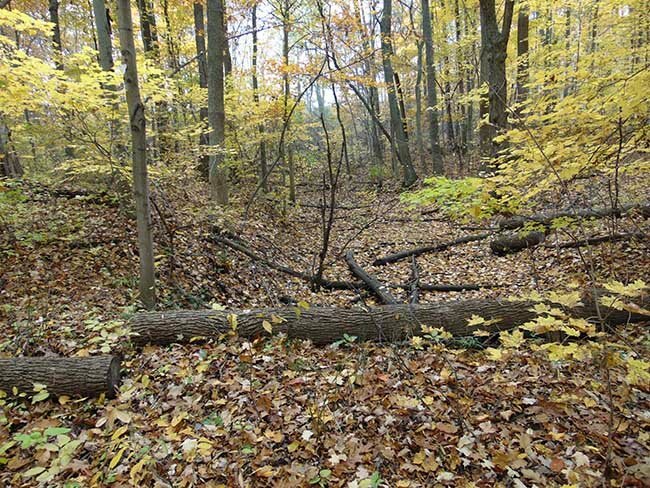 One slope of this trail meanders through a section of forest that has had its mature ash trees killed by the invasive emerald ash borer, an insect native to Asia. The dead ash will decay and serve to nurture the soil for future ash and other native tree growth. Following the trail will lead you to the open water pond found at the tail-end of the marsh, a scenic spot where you may encounter herons, ducks, geese, kingfishers and many forms of aquatic life. This trail is not wheelchair accessible as there is a long 35° slope down to the marsh. A wheelchair friendly boardwalk is available to view the marsh along the Millstream Trail (please refer to map and Millstream Trail information above). 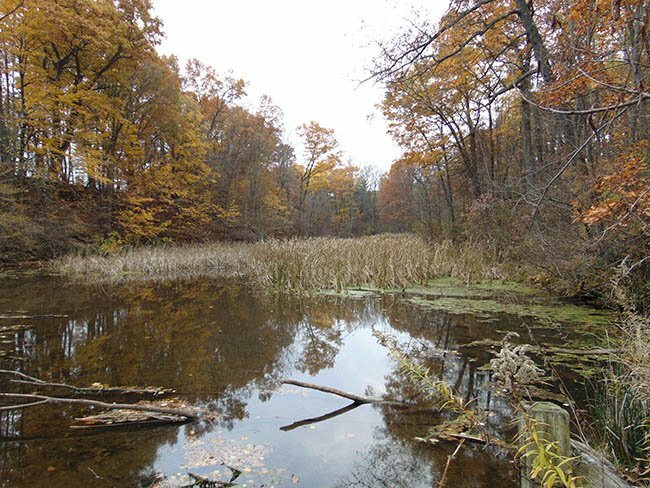 Trail Features – The sloping pathway through the forest intersects with the Millstream and Pondview Trails and continues on to the marsh-dock viewing area. Many large white ash trees have had to be cut down and line the edges of the trail. Forest nutrient recycling and regrowth may be observed in these areas. The marsh-dock is a great spot to take photos, paint or enjoy the sights and sounds of nature. Wildlife You May Observe: Belted Kingfishers, Wood Ducks, Canada Geese, Great Blue Herons, Red-winged Blackbirds, leopard frogs, American toads, gray tree frogs, green frogs, brook sticklebacks, muskrat, American mink, red fox, and many others. This .6 km trail travels from a park-vehicle access lane to intersect with the Eastwood (blue trail marker arrows) and Millstream (red marker arrows) Trails. On one arm of the trail you can experience forest “edge” – the space wildlife utilise between open agriculture field on one side and the forest interior on the other. The other arm of the trail takes you alongside the Millstream Pond and allows a beautiful view of Longwood’s stream ravine which contains a pond water ecosystem. Sunning turtles can be viewed during the summer months and swimming fish can be viewed from the trail’s high vantage point. Watch for kingfishers and great blue herons searching for a meal. This trail is not wheelchair accessible. Trail Features – Sloping trails with high vantage points overlooking sparkling waters on part of the trail with a young forest community possessing a variety of tree and shrub species alongside a farm field on the other.